For some New York City high school students, summer means days at the beach or tennis courts. But for 100 participants in the Summer Research Internship Program at The Cooper Union, summer means science. At no cost to the students, ambitious teens from the five boroughs spend six weeks applying scientific principles to tackling high tech challenges such as the transport phenomena of tomato sauce, analyzing carcinogens in common cooking oils, developing battling mini-robots; engineering clever Rube Goldberg contraptions, and examining unconventional methods to reduce electrical consumption. 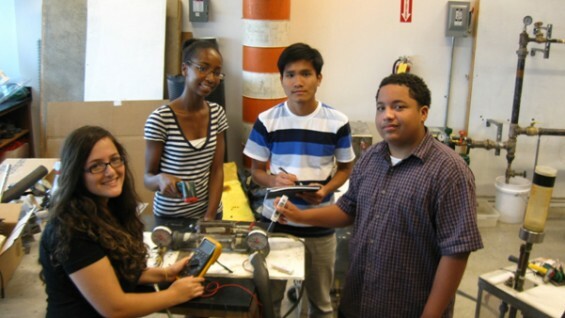 Since 1987 this free program, funded in part by Consolidated Edison, Inc., has been a gateway for high school students from underserved communities who want to learn more about science, technology, engineering and math. Each project is supervised and mentored by Cooper Union faculty and covers fields such as civil, chemical, electrical, mechanical, biomedical and environmental engineering; mathematics, and chemistry. Nearly 100 percent of the participants are accepted to college, with more than 70 percent going on to study math and science. Gotham Schools featured these budding scientists on the day of their final presentations in the Rose Auditorium, where they talked about their experience working on real-life projects along side Cooper Union faculty.